As veterinarians, our ultimate goal is the health of our patients, through preventing the onset of disease and injury or by treating and curing those that occur. We come to our practices with a set of tools: instruments and knowledge that are continually updated with education and experience. When those basic tools fall short, we are as devastated as the clients we serve—we love our patients, and we hate to lose. We look for other resources, referring to university or specialty centers, or becoming specialists ourselves. For Dr. Calm, it was the complementary practices of acupuncture & chiropractic that were added to the tool box—not replacing but adding to the resources already at hand. Both acupuncture & chiropractic make use of what is inherent in the animal’s body, not adding or taking away anything. Both are concerned with removing obstructions to the body healing itself—quite a different concept than the pharmaceutical model. There are no side effects to these treatments, no possible overdoses or unfortunate metabolic reactions. That being said, Dr. Calm is a veterinarian first, and will help you to evaluate whether any conventional veterinary care is necessary to protect the health and safety of your pet. This defines her work as a complementary or holistic practitioner, rather than a simply alternative one. Dr. Calm is certified by the International Veterinary Acupuncture Society. 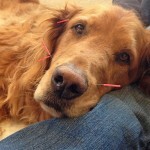 Acupuncture should always be considered when an animal has not responded to conventional medicine. Chiropractic treatments make use of what is inherent in the animal’s body with no side effects, possible overdoses, or unfortunate metabolic reactions.